hamstrings - as well as in my sides and upper back. 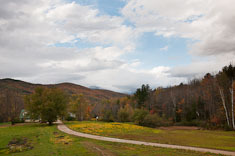 We walked down to the Valley Cross Road and up to the Eagle, then across the golf course bridge to the lower field via the ski trail. 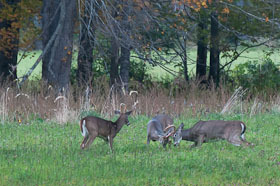 As emerged from the pine woods into the lower field, we spotted three deer near the far end of the north lower field. Through binoculars we could see that they were three bucks, apparently a spike, a two and a three-year-old. I managed to get a few distant photos of the two older ones sparring while the spike looked on, as if puzzled by their behavior, or perhaps wanting in on the action. 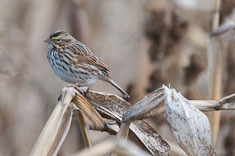 I stayed down in the field for a while, checking for sparrows in Rick Davis' weedy corn field over by the river in the north lower field. 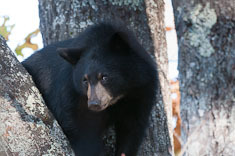 The corn has been frosted but the ears are still sweet enough to interest bears according to Rick. 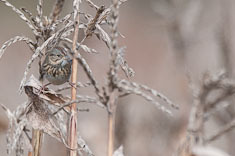 I talked to him for a few minutes while we watched a Northern Harrier hunting on the far side of the field. The light was marginal for photos but I took a few anyhow. 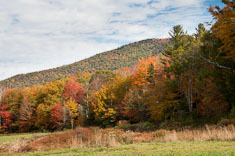 Drove up to Gorham with John to view the foliage, which was about at its peak in Pinkham Notch. 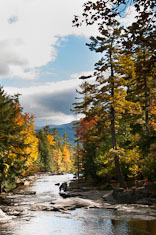 Thompson Brook and the lower slopes of Wildcat were particularly colorful. We went walking down along the Androscoggin where I'd walked a few years ago while Eric had an appointment for his knee up in Berlin. The colors were better then; today the red maples seemed to have mostly lost their leaves. Despite getting lost we had a nice walk, about four miles. My hamstring wasn't as tight as yesterday, a good sign. On the way back I let John go ahead while I walked part way up to Mascot Pond, then had a few minutes of concern when I arrived back at the car and he wasn't there. He showed up about 15 minutes later having crossed the railroad bridge on the upper level and not been able to find a way down for almost a mile. 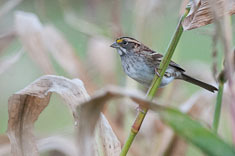 Earlier today I went birding over by Tracy's and down to the lower field, where I found lots of sparrows in Rick's corn field. 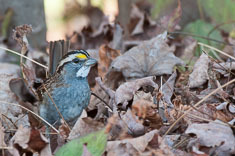 Altogether I had seven species - Song, Lincoln's, White-crowned, White-throated, Savannah, Swamp and another sparrow, probably a Chipping. I managed to get photos of all but the Swamp, which I only glimpsed briefly. 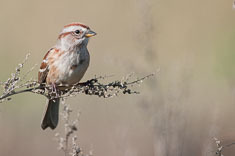 Most of the White-crowns were juveniles which to me look alot like Tree Sparrows, but upon review of the photos, I didn't find any Tree Sparrows. I've seen them down there before, but perhaps they arrive later. 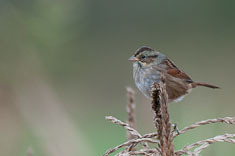 Birded the lower fields again today and found two Swamp Sparrows, confirming my sighting from a few days ago. 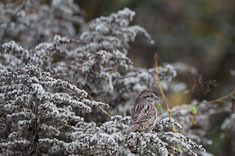 When I reviewed the photos, I realized that the sparrow I'd identified on 10/2 as a Chipping was actually a much-rarer Clay-colored Sparrow. Other species new today were a Rusty blackbird (or perhaps a Common Grackle - all dark with a pale eye, no rusty color evident in flight but tail didn't seem long either) in the corn patch and a Mourning Warbler (which I initially identified as an equally rare but less interesting Orange-crowned but the narrow white eye arcs and short tail extension beyond the undertail coverts indicate a Mourning, my first ever in New Hampshire) in the brushy area where Sarah's road enters the upper field. 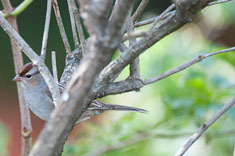 I also saw the Gray Catbird I've been hearing in the brushy area along the river between the two lower fields. Yesterday Mom wanted to get out hiking. 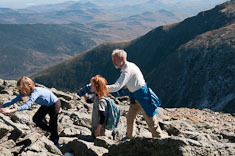 It was a bit of a challenge to find a hike that both she and John would enjoy. Mom prefers trails and doesn't mind somewhat steep terrain but doesn't want to go longer than a few miles. John doesn't mind longer distance but has difficulty with his balance on rough or steep trails, preferring roads for that reason. 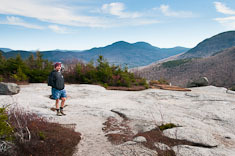 We eventually settled on Lookout Ledge based on a suggestion from an article in a New Hampshire magazine in the upstairs bathroom. It turned out to be a good choice, not too difficult for John (though pushing his comfort zone a bit) and not too long for Mom, and quite scenic as well. Eric came with us and we all ate at Libby's in Gorham afterwards. I had confit (fancy word for "leg") of duck with duck sausage and lentils, very tasty, and of course the flourless dark chocolate "Baby Cake" for dessert. So delectable! Spent all day completing and deploying the Half Fanatics site changes. I changed the header, adding menu items on the left side as with the Maniacs page heading. That freed up space on the member nav bar, which I put in a common file to be shared by all the member pages. I coded the "Find a Fanatic" page yesterday but still need to do the "Find a Race" page, later this week I hope. Around sunset I got out for a short but energetic run. My legs felt good so I ran up hills, which are plentiful around here. I think I'm fully recovered from the marathon last week. 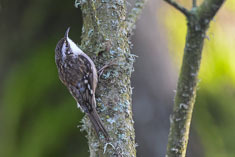 and 5 White-throated. 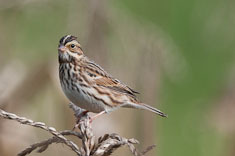 No Lincoln's yesterday, though I had several today in the thickets along the slough across the field, so they're still around. 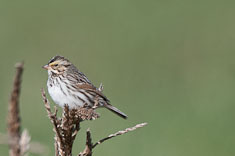 The dozen Swamp Sparrows (with 8 more along the slough) were by far the most I've ever seen in one place before. barn. 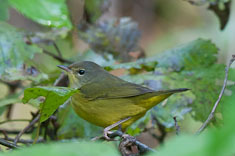 I found more Palm Warblers along the slough and over by Sarah's, where they were loosely associated with the big junco flock in and around Sarah's yard. Though I had opportunities for good photos, I blew most of them, either not quick enough, or wasn't zoomed in all the way. That's a common error when I'm using the lens cover. 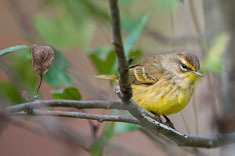 Nonetheless I'm improving with the bird photos, not making nearly as many errors with camera settings as I used to. I got about 15 pounds of potatoes yesterday, most of them intact but somewhat small. 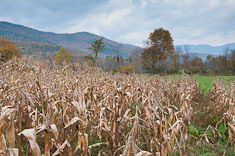 Rick had used a plow-like attachment on his tractor to try to dig his potatoes but the weeds were so thick that he wasn't able to find the rows in places, leaving some potatoes behind. I found some of them yesterday but strained my lower back turning over the hard-packed soil. It was quite stiff and sore in some positions yesterday evening but improved some overnight and some more today, so that tonight it's barely noticeable. I'll run tomorrow but today went swimming with Mom and John at Bear Peak instead, 20 laps in about 25 minutes. Glad I still remember how - haven't swum since skinny-dipping with Alison (she didn't, but I'd forgotten my swim trunks) at Diana's lake last July. Dinner at the Wildcat Tavern this evening, "two fer" night, with Andy, Gaye and Whitney as well as Mom, John and Eric. The food there is quite good and Mom and John are sufficiently regular there that the waitress and the hostess separately said "See you next week" as we were leaving. I had the seafood special - sweet tender scallops and decent shrimp topped with a crabmeat stuffing - and it was very tasty, even if unclean by the rules by which I used to live. Gaye related an entertaining story about dinner with John and Mary recently, by way of illustrating their lifestyle. She'd been a bit put out because John and Ben turned off the water at Overlook without giving Gaye, renting Janet Greene's house, advanced notice. 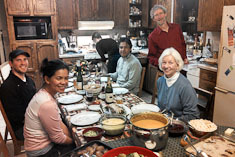 To make up John and Mary invited Gaye and Whitney up to supper, but because the water was still out, asked them to save their chili bowls and lick them out in order to reuse them for salad, and then again for desert after the salad. Mary sent them home with a quart jar of water to split between them to tide them over for the 24 or so hours the water would be off. Whitney observed that the quart of water hadn't been enough to permit her to shower before going to work (at the Tavern) that evening. Ran up over Black Mt today but was very tired, felt like I was running in cement. Beautiful afternoon though, with a brisk NW wind blowing clouds over from Mt Washington, bright sunshine highlighting golden leaves on sugar maples and beeches. The air was chilly, high 40's, and by the time I got back down to Whitney's my hands were so chilled I could barely focus my binoculars. 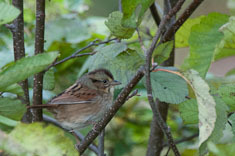 Birding was slow - all the warblers were Yellow-rumps and most of the sparrows were Juncos. 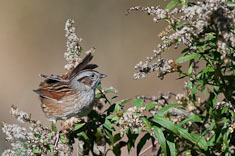 Excellent birding and photography this morning, especially for Swamp Sparrows; I counted 30 and photographed half a dozen different individuals. 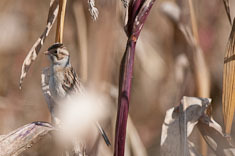 The light was generally good and a stiff NW breeze kept the corn stalks moving, enabling me to get closer to the sparrows without flushing them. Unfortunately the breeze was also chilly for the first hour or so. 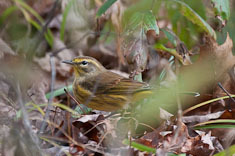 Here's my list for the morning annotated with some photos. This afternoon I borrowed the Subaru from Mom & John to drive over to Burlington for the Green Mountain Marathon tomorrow. 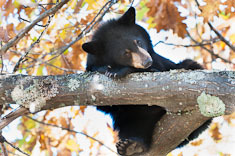 I was about ready to leave when John came in from his walk around the triangle and reported that a bear was was up in an oak tree by Whitneys. An outdoor wedding reception had been underway right under that tree when one of the guests had looked up and noticed the bear overhead. The reception dissolved as everyone ran for their cameras. 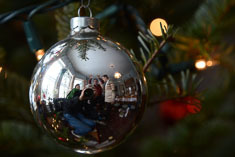 I drove up with my long lens and joined the crowd still lingering around the tree. 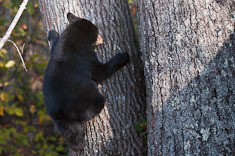 The bear was there, a young one judging by its size, and very photogenic. Fortified with bear photos I set out for Vermont, though the photos did little to ease my disquiet about heading out into the unknown. Some people find the prospect of new places and new people stimulating. I'm generally not one of them. As I drove away I felt anxious and utterly alone, as if I would never again see a familiar face. 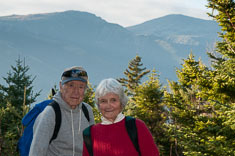 The scenery through Crawford Notch, and especially the view of the Presidentials covered with snow behind the sunlit Mount Washington Hotel, effectively distracted me. 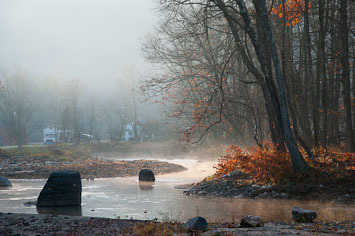 After stopping for photos, I pulled up a new book on my IPod and listened all the way to Marshfield Vermont. 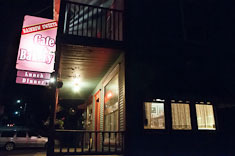 Looking for a place to get a quick but not fast-food supper, I passed the Rainbow Sweets Bakery and Cafe. Just a small place but offering warmth and light in the darkness, and the prospect of something quick to eat, I turned around and pulled in. A middle-aged man with wire-rimmed glasses in a plaid shirt and gray apron greeted me with "How are you?" I responded "Fine" and he quickly replied "Not nearly as fine as you'll be once you've had some supper. How about one of everything on the menu?" "I'm not quite that hungry," I said, and ordered a Moroccan chicken pastry and a Greek salad. "Would you like to enjoy your dinner in the privacy and comfort of your automobile", he asked, "or at one of our elegantly appointed furnishings", sweeping his arm out to indicate the plain wooden tables and mismatched wooden chairs packed into the narrow space between the counter and the front door. "Here, I think", I said. He hastened over to a square table in front of the brightly-lit bakery case and made a show of pulling out a chair for me. "One fine dining experience on the way" he announced as I sat down." And he was right. His assistant and waitress, a tall woman in her 40's with dreadlocks piled in a bun on top of her head, fixed the salad and brought it to me. It was delicious, with Kalamata olives and a lemon-thyme dressing. The Moroccan pastry was mildly sweet though a bit dry and not quite as flavorful as the salad led me to expect. For desert I ordered the dish featured in a yellowing newspaper article pinned to the wall, a set of three custard-filled pastry balls embedded in a mountain of whipped cream. "An excellent choice", he exclaimed after I explained that I was on my way to Burlington to run a marathon tomorrow. "Here are the carbohydrates and calories you'll need on your way to victory." Whe I told him that victory was unlikely and that the desert probably had more fat than carbohydrates he quickly admonished "Fat is not a word we use around here." Another group came in as I was eating. They were apparently local because they immediately began talking to the proprietor, whose name was Bill. They asked about his daughter who had just had twins in New York City. The smaller of the two twins had low blood sugar, Bill explained, not really a problem, but the baby was being treated nonetheless. The customers sat down and ordered pizza and wine, continuing to chat with Bill. One of the two men also wore his hair in dreadlocks which seemed to fit with the comfortably eccentric atmosphere of the place. They all wished me success in the marathon when I got up to leave. The hostel in downtown Burlington was similarly strange but comfortable. A small sign and a buzzer keypad marked the door. The host buzzed me up when I gave my name and requested that I remove my shoes when I walked in, explaining that I could help myself to a pair of slippers if I wanted. He gave me a brief tour, pointing out the men's and women's showers and restrooms separated by curtains on either side of a common passageway and leading me to the men's bunkroom. A bottom-level bunk in the corner was available so I claimed it, then dug out my computer and wandered out to the common area, a large and somewhat dimly-lit room with windows overlooking the street, a bookcase on one wall and a counter with sink, microwave and coffee maker on the opposite wall with easy chairs and a couple of long tables scattered in between. 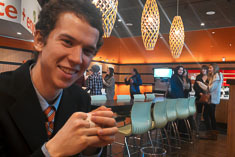 The tables were occupied mostly by young men about the kids' ages with laptops or tablets, so I settled into a chair with my laptop. From the bunkroom beyond mine I heard women's voices laughing and speaking French; after a few minutes the group of girls, probably college students, emerged into the common room, put on their shoes and went outside. I stayed up for an hour or so. I didn't talk with anyone, but no-one else did either. I was in bed before the girls returned and slept so soundly that I didn't wake up until the third alarm on my watch. Green Mountain turned out to be another cold cloudy and damp run. Wind, rather than rain, was the challenge today. I'd envisioned a social run today but wasn't up to it so ended up running alone and pushing the pace again. The first half was mostly downwind; I sailed through splits of 7:50 to 8:05 in the first ten miles and 3:30 overall started to look within reach. Mile 13 was tough though. Cold rain with a 20mph headwind cost me the minute under 8:00/mile that I'd banked between miles 6 and 12. There were several more tough miles (18 comes to mind) in the second half where both wind and hills clobbered my pace. I kept my two mile splits under 18:00 but slowed to 8:25/mile overall in the second half for a six minute positive split. Though I wasn't able to achieve my mid-race revised goal of 5 minutes under my BQ time, I still finished in 3:35:52, two minutes faster than Smuttynose two weeks ago. I felt reasonably strong through most of the race so I think the wind was the biggest factor in my slowdown. On a sunny day the course would be a very pleasant run, much of it along the lake through fields and woodlots, farms and rural homes. Other than a few short sections on busy roadways, most of the run was on back roads, some of them hard-packed gravel a little softer underfoot than pavement. Support was excellent with aid stations every couple of miles offering Gatorade and water, and gels as well at about half of them. Miles were clearly and accurately marked. There weren't enough Porta-potties, but that's typical. The finish area, indoors in a school gymnasium, provided essential shelter from the cold rain at the finish. The hot chili was delicious and the hot cider was nice too. 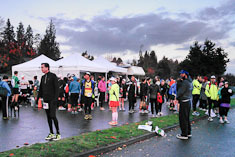 I hung around for about an hour after finishing, talked to a few other runners, ate some chili and drank some hot cider. The crowd seemed younger than usual, though that could be because I left before most of the older runners finished. Many were speaking French; I could understand a word here and there but couldn't pick up the meaning of most of the conversations. I walked around some, sat some, stretched some. My legs, particularly hamstrings and glutes, were stiff and achy and didn't recover much, making the drive home a bit uncomfortable. On the way home I stopped again at the Rainbow Sweets Bakery and Cafe. The Greek salad was delicious, the Spanikopita quite good and the conversation stimulating, as before. 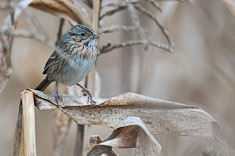 orchard behind Tracy's and for sparrows in Rick's corn patch. 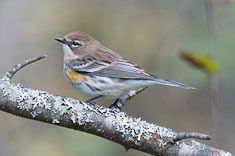 Nothing noteworthy, though I did see my first Eastern Phoebe in almost two weeks in the orchard, and several Palm Warblers in the draw by Sarah's. 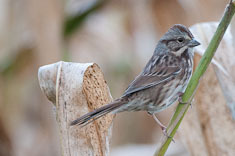 The wind started up about the time I reached the lower field and I got well- chilled stalking sparrows among the corn stalks. I warmed up by unclipping tomato plants in Sarah's greenhouse. The vines killed by the hard frost late last week are now coated with a fine brown powdery mold which dispersed like smoke when I disturbed the vines. Oddly enough two branches of one of the green plum tomatoes are still fresh and undamaged though their yellow flowers and small green fruits have little chance of ripening now. It's blustery and cold out this afternoon so I stayed inside and read after lunch. 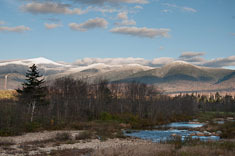 Mount Washington is completely obscured by a blanket of furrowed gray cloud which hugs the countours of ridges and ravines as it pours down into Pinkham Notch. Fragments of cumulus rebound up behind Spruce and curl into orange sunlight. We're in shade down here in the valley. The wind whistles around the corners of the house, rakes the ragged tops of the white pines and tears at the stubborn leaves of the oaks. They're not letting go. apparently stages as well but there were no cars. The snackbar was open but fare was limited, which was OK since we still had some lunch left. Our descent took just as long as our ascent, about 4:30. Because we didn't leave the summit until 2:45, that meant we finished the last mile of the hike by flashlights. There was no moon. By the time we reached Pinkham, we'd said goodbye to twilight and to dusk and given up trying to count the emerging stars. 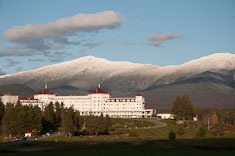 The granite dome of Middle Sugarloaf Mountain over by Bretton Woods is a beautiful little hike. I'm surprised I've never been up it until today. 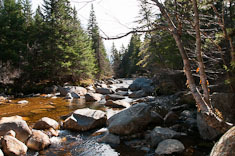 The trail follows the Zealand River for a few minutes then ascends through open hardwoods to the granite backbone between the Middle and North peaks. Wind has stripped most of the leaves from the forest canopy allowing sunlight to reach the understory beeches, whose warm yellow leaves illuminate the forest from within. From the saddle the trail follows spruce-carpeted ledges into a forest of dying old white birches, then back into spruce again up across more ledges to the broad open summit. The birches were approaching old age already when the ice storm 15 or so years ago broke off most of their limbs and finished them off. On a fallen spruce among the birches I counted about 100 rings, evidence that the present forest may date back to extensive fires between 1900 and 1905. 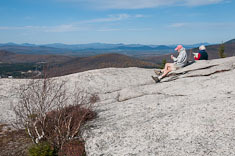 We ate lunch on the flowing ledges facing west towards Vermont. Angular blocks and a darker gray erratic still sit on the bedrock where the glacier left them 10,000 years ago. By comparison our 30- minute stop for lunch didn't make much of an impression, though 50 years of hikers' boots have partially eroded the islands of granite sand, sedge and Labrador Tea perched on the speckled granite. John, expecting to be slow on the descent, left early while we lingered, savoring the view. I stayed on a few more minutes to take some photos while Mom and Eric started down. None of us caught up to John. I made a short detour over towards North Sugarloaf but made it only as far as some pegmatite diggings along the trail. Inspecting the tailings I found lots of quartz with shiny crystal faces but nothing well-formed. It was nice to run a marathon in the sunshine for a change. The air was chilly at 8AM and I could blame my fast start on that but the truth is, I'd already decided to try for my third BQ in three weeks. My goal was to average 8:20 for the first half. That should have been a little easier than my pace last week, and allowing for a little slowing in the second half, would enable me to come in just under 3:40. I began to question that strategy as early as miles 3 and 4, which were tough. I just wanted to stop and walk, but I ate a gel instead and that helped. After slowing to 8:30 for miles 5-6, I brought my pace down under 8:20 though mile 14. By 16, I'd decided to give up on 3:40 and go for 4:00 instead. My legs and feet were hurting and I didn't want to jeopardize a quick recovery next week. Still, I held onto sub-3:40 through 18 before giving up and walking. Running was difficult after that for a few miles. By 21 I'd recovered some and ran a mile or two at about 8:45, trying to keep up with some young woman I'd been running next to early in the race. Unsuccessful at that, I walked and ran the last several miles and crossed the finish just a couple minutes under 4 hours. I was quite stiff and sore at the finish and during the drive out to Vermont. Near Orange MA I stopped pulled off on a side road and rinsed off with a pint of bottled water. After walking around a bit my legs began to loosen up and feel better. I reached Townshend around 4:30, just as George and Jean were setting out for a walk. I joined them. 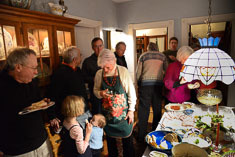 It was a good way to get reacquainted after 40 years, strolling along wooded cross-country ski trails in the late afternoon sunshine, watching their dogs and reminiscing about shared friends and old times, families and careers. I stayed with George & Jean Sunday and Monday nights. Jean is teaching math and reading to primary students, grades 4-6 I think, and George does technical support for the regional high school in Brattleboro, keeping their computers, printers and programs all running. They live in a gambel-roofed log house with a huge front lawn in a wooded stream valley where mansions alternate with mobile homes. 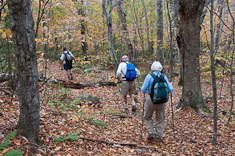 Lots of hiking trails nearby double as cross-country ski trails in the winter. The nearest town is three miles away and consists of a white church with a tall steeple and handful of white houses around the town green, with a post office, a gas station, a pizza place, a little market and some antique stores down the road. 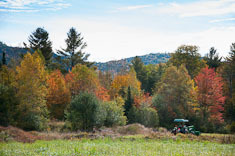 Pretty much postcard Vermont. 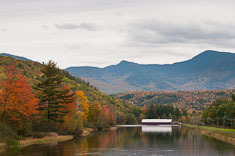 Brattleboro, a hip-looking micropolis, is another twenty minutes away, past the longest covered bridge in Vermont. George bicycles for exercise, long rides in the summer and shorter workouts after work in spring and fall. He's accustomed to being the most athletic person he knows but reluctantly conceded that my marathons on successive weekends trumped his two hour bike rides. On Monday while they were at work I found an Internet reference to a nearby hawk-watching site and drove over to see if I could find some birdwatchers. 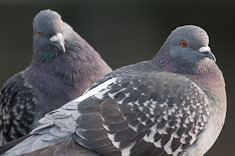 I found them sitting on top of Putney Mountain, all looking off to the northwest through their binoculars. 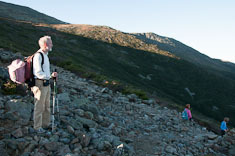 Putney Mountain is a narrow north-south trending ridge about ten miles long. The birds were surfing the invisible wave generated over the ridge by the northwest wind, soaring overhead one after another. Many were so high they were barely visible without binoculars but others sliced right overhead, in sight for just a few seconds. 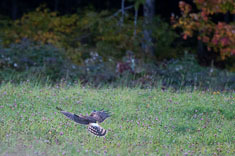 I ended up spending the day there and in six hours saw about 75 hawks of 12 different kinds. Of the 16 species that regularly occur in the northeastern US, we missed only Bald Eagle, Broad-winged and Rough-legged Hawks and Gyrfalcon. 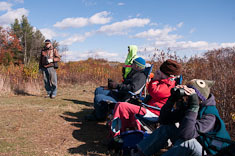 Several of the other birdwatchers there had impressive hawk-identification skills. 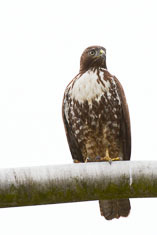 Between hawks, we talked about, among other things, what constitutes a true Vermonter. One fellow, dressed in an old brown coat, work boots and grubby blue jeans, observed "Just because your cat has her kittens in the oven, that don't make 'em biscuits." 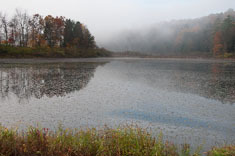 Said goodbye to George and Jean in southern Vermont this morning and drove to Boston after a brief visit to Allen's Marsh in Westminster. 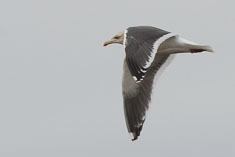 I enjoyed watching the fog clear but didn't spot the reported Greater White-fronted Goose. Misled by my phone I lost 20 minutes trying to get to Keene but still made it to Boston in time to join Mom & John for oysters at Petit Robert. I didn't like them as much as I'd remembered from the last time I ate them. That was probably 30 years ago. into a 2-year contract so will have to raise a stink if the service isn't as promised. In the evening we ate at Petit Robert again before going to symphony. Mom & John ordered escargots for an appetizer and scallops for dinner. I ordered a lobster salad and Petit Robert gave us a plate of six oysters after we told them we'd been unable to order desert at lunchtime because they were too busy. Four types of shellfish in one meal is some sort of record for me. The concert must have been very good because the audience didn't stop clapping at the end until the pianist had come out six times, and played an encore after the fifth time. I was somewhat distracted by twitchy hamstrings, the left one in the first half and the right one in the second, and struggled to stay awake in the third movement of the final piece, Rachmaninoff's Third Piano Concerto. 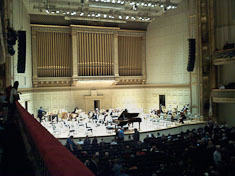 Nonetheless, I always enjoy concerts in Boston's Symphony Hall because the acoustics are so good. Not that I can detect the difference between Symphony Hall and any other, but it's nice just to know that I'm listening in one of the best in the world. After breakfast with Mom & John at the Trident Bookstore (the Huevos Rancheros were delicious), I drove out to Salem and visited Stacy and Harry in their airy sunlit apartment. She and I walked over to a bakery downtown and reminisced about post-high-school escapades. After running the Grapevine for the past 25 years, she's in the process of selling it and isn't sure what happens next but it may involve an Airstream trailer. From Salem I drove over to Concord and met with Whit for three hours. Sales are growing more slowly than expected but the partnership with ERB, now just getting off the ground, has good potential. Apart from ERB they're in 50 schools now with quite a few more in trials. Research in Maine has demonstrated a significant improvement in test scores after a year of using the program. Although they're not in the black yet, prospects still look good and there don't appear to be any significant competitors on the horizon. 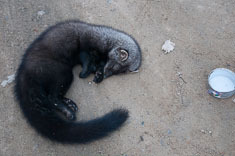 Came across a Fisher today, apparently poisoned but still breathing, curled up in the middle of the road up by Camp Gout at the top of the Carter Notch Road. An empty cat food can was sitting next to it. The Fisher was about three feet long including the long tail, mostly blackish-brown grading into grizzly gray on the upper back. The fur looked soft and sleek but felt a bit coarse. I hated to leave it there in the open but didn't dare pick it up to move it. I haven't seen one since I was in college, when they were still fairly rare around here. Apparently they're more common now. I ran up and down some of the Black Mountain ski trails this morning and hiked up to Hall's Ledge with Mom & John this afternoon. Right inner/upper hamstring is a bit tight this evening. The leaves have fallen from most of the trees other than oaks and scattered yellow poplars. The past few days have been dry so the leaves were noisy underfoot - not much chance of sneaking up on a bear or deer in the woods. We heard machinery up ahead and found Rick in the orchard mowing. He stopped and we chatted for a while. Touching on politics, Rick made some comment about the mess in Libya. When I wondered why Romney hadn't made more of that in the debates, Rick figured it was because he was too big a man, as if taking political advantage of the current administration's misteps was beneath him. That's about as positive a view of Romney as any I've yet come across. 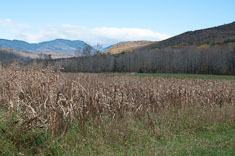 From along the Wildcat River by our lower fields you can't see Mount Washington; it is hidden behind the nearby ridge of Spruce Mountain. 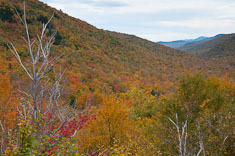 Instead you see the long blue ridge of Wildcat Mountain, gradually rising from the shoulder of Spruce to a sharp dip at the top of the ski area, then over a little knob (Wildcat "C") and down to a saddle, then rising again to the doubled summits of Wildcats "B" and "A" before plunging into the deep gap of Carter Notch. East of the notch the ridge climbs again to the rounded summit of Carter Dome, barely visible over the shoulder of Black. I've looked up at those mountains as long as I can remember and I've hiked to Carter Notch and Carter Dome several times, even in winter. I've hiked the trail along the west half of Wildcat Ridge to the top of the ski area and skied the trail down the south side of that ridge to Hall's Ledge and on down the valley to our fields, but I've never been between the ski area and the notch, over Wildcats C, B and A, until today. cars there when we left yesterday so I figured someone would have picked it up. The fur is probably worth $25-50 un-processed. 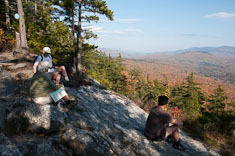 I parked at the Bog Brook trailhead and ran up to the Wildcat Valley trail then mostly walked up to the summit of Wildcat. After climbing through young growth from 60's era clearcuts, the trail ascends through a once-beautiful open glade of white birches. 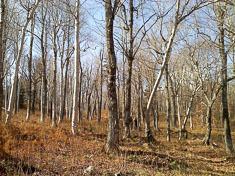 The glade is still open with an understory of waist-high raspberry canes but most of the birches stand dead, having failed to recover from losing their limbs in the ice storm a decade ago. 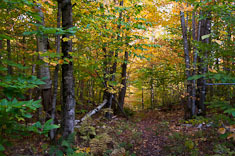 Above that the trail follows the ridge for a while then traverses along the south/east slope through Red Spruce and (mostly) Balsam Fir and birch forest. Much of that section is damp and the bed of the trail is carpeted with deep green moss through which moose have been postholing. 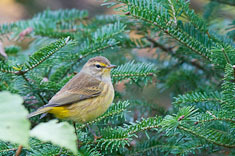 I saw no mooose, nor many birds either, just a few chickadees (Boreal and Black-capped) and Red-breasted Nuthatches and a couple of remnant robins. Ascent to the ski area took about 1:20. From the summit of the ski area over to the Moriah trail in Carter Notch took me another hour, plus 10 minutes for stops, which were primarily at the few views. I passed Wildcat A, the high point and a new 4000 footer for me, without noticing it. 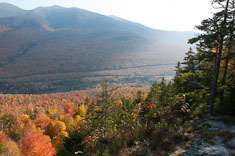 The best view overlooks Carter Notch just before the trail starts down. From above, on either side, it's a wild looking place with little evidence of human intervention other than the hut and supply sheds. The four mile hike up over Carter Dome and down the Rainbow Trail to the Wild River trail took about 1:15 plus another 20 minutes of stops. 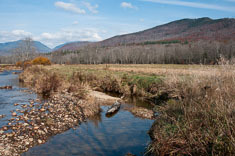 Though I saw the sign for the Bog Brook trail I lost the trail itself where it crossed the stream so decided to continue on the Wild River trail over to the Wildcat River trail out of Carter Notch. At that point I resumed running since the sun was pretty low in the sky. I covered the last three miles out to the trailhead in about 40 minutes, making my total time and distance about 6 hours and 15.2 miles by the AMC Guide, 13.85 by my Garmin 410. Only one photo, which I took with my phone before the battery went dead. 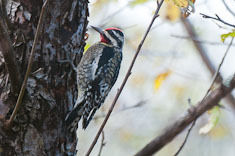 The Savannah and Swamp Sparrows, the Yellow-rumped warblers and the Yellow-bellied Sapsuckers have gone south. 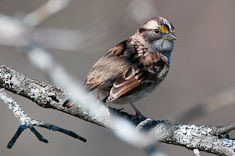 Song and White-throated Sparrows are still around and Tree Sparrows have arrived. Most of the trees other than oaks, apple trees and cottonwoods are bare. Down in the lower field Rick plowed his corn patch but hasn't gotten to the weedy gourd patch at the north end of the field, so that's where the remaining sparrows are hanging out. I got a few photos down there this morning. 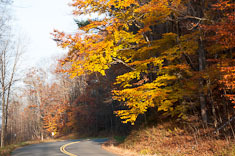 I'd planned for several months to run this with Eric but when we drove down to Eastern Slope Inn to pick up our packets, I discovered that I'd never signed up. They'd been full for a couple of weeks but I asked the Race Director and he told me they had plenty of shirts and I was welcome to register on the spot, though they might not have enough medals. I got bib number 684 out of 700. Though I probably would have bandited it, I was glad that I didn't have to, and I really like the dark red shirt. We ran a very consistent pace, right about at 9:00/mile for the whole distance. Though we finished together, I only ran with Eric for the first mile, and then again for the last three or four. In between I ran with a Half Fanatic whose name I didn't write down, and can no longer recall, though I believe he was from Augusta, Maine. We had a nice time visiting together and he was pleased to finish with one of his better times, which he attributed in part to our steady pace. Altogether I found a lot to like about this race. 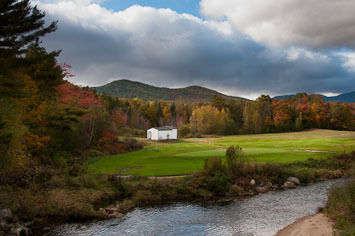 The new course, down route 16 through North Conway to the East Side road through the Conway covered bridge, then up the West Side Road, was more varied and interesting than the old course. Parking and access on race morning were both really easy. Aid stations every two miles and great wraps, sandwiches and pizza at the finish along with the more typical oranges, bananas, bagels and cream cheese made for good food and drink support. The medal was very nice and the shirt even better. The only improvement I can think of would be to add a marathon, which actually would be quite easy to do - turn left at the Conway covered bridge, return to hwy 16 through Conway to the Kancamaugus, run up to the Passaconway road, turn right through the covered bridge then take the right fork for the last mile or so to the West Side Road, where the marathon course would rejoin the half marathon course to the finish. 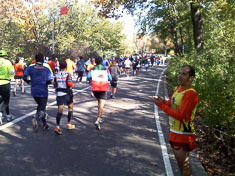 I jogged up to Central Park this morning to do some birding and ended up running a marathon. 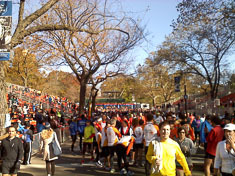 The New York City marathon was cancelled late Friday afternoon, a few hours after I picked up my packet at the expo. I'd arrived Friday around mid-day via the LimoLiner bus from Boston and Susan had only just been dropped off at our hotel by the airport service from LaGuardia when I heard the race had been cancelled. It was too late to get any refund on our hotel or change our bus tickets back to Boston. Roughly 40,000 marathoners were in the same boat. They'd come to New York on Mayor Bloomberg's assurance that the marathon would go on. They'd spent their money to get here and to stay here and now Bloomberg cancels the race due to political pressure from Staten Island and the other boroughs suffering from the destruction wrought by superstorm Sandy five days earlier. They were looking for a scapegoat and the marathon was it. them almost everywhere I've been. I continued as far as the lake and found lots of birds in the thickets above the lakeshores, so that's where I was headed this morning, this time with binoculars. From the hotel this morning I ran up 6th Ave/Avenue of the Americas, the most direct route to the park at 1.5 miles on the gps. The buildings around 45th St are particularly impressive, big and clean and bright, thanks perhaps to recent pressure-washing by hurricane Sandy. Entering the park I joined a fair crowd of runners heading north on East Drive. There was a steady stream heading the other direction too. Up ahead of me I spotted another Maniac so I picked up the pace a bit to catch him. His name was Guy, #942, and he was on his second of four laps around the park, mile 8 of a marathon. He was wearing his race bib and was doing his race on the old NYC marathon course. We got to talking so I decided to do a lap around the park with him. He lived near the city, worked at Macy's and knew his way around. 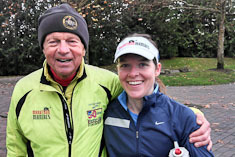 His wife was a runner too but eight months pregnant, so not doing marathons. We ran up the big hill at the north end of the park, through some fairly wild-looking woods, probably good birding but I didn't notice many. A few of the side roads were still closed; we passed a crew feeding a loud chipper, and piles of logs and debris here and there along the way. Most of the trees still have their leaves; some are turning yellow, others still green and all beautiful in the sunshine under a bright blue sky. Guy waited while I stopped for a cell-phone photo, and offered to take one of me. As we approached the finish line we ran into a big crowd of people and had to stop and thread our way through them. More photos. Turning east again we saw a dense stream of runners approaching from 9'th Ave. They caught up to us when we stopped a couple miles later to buy Gatorade from a roadside stand and we had to wait a minute or so before we could find an opening to join them. As we approached the finish again I found a man offering Cliffshot gels and picked one up, having already eaten the one gel I'd brought with me. Between that and the Gatorade, and a few pretzels and a banana that I picked up during the second half, I had enough to finish the marathon. People had come out to support the impromptu race, offering water and cups, pretzels and popcorn. The course was crowded for our second and third laps; I'd guess at that point there were 10-15K runners on the six mile loop. Many were wearing singlets with the name or colors of their countries. We saw lots of runners from France, Mexico and Italy, and others from Sweden, Spain, Costa Rica, Venezuela, Peru, Brazil. Guy began to slow down during my third lap with him, somewhere around mile 22 for him, so we parted company. In the remaining eight miles or so I talked with runners from Wisconsin, Trinidad and Indonesia, and ran half a lap with a young woman from Germany. Her parents had decided to run the NYC marathon together and had offered to bring her and her sister along too. Her sister was somewhere up ahead; her parents still behind her. Like everyone else I talked with, they'd decided on their own to come out to Central Park and run a marathon this morning, four laps around the loop plus a little extra (1.8 miles actually). She'd studied geo-ecology in college and had worked for a couple of years but now had two children so was staying home with them, except for this trip. NYC would have been her first marathon, and I think she'd have had a tough time because she was slowing down already, on just her second lap. 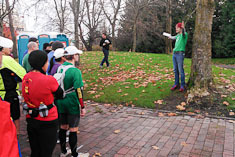 On my third and fourth passes through the finish area, someone was holding a sign for the "Run Anyway Marathon 2012", and our event had a name. I finished my Run Anyway Marathon right about where I'd first caught up to Guy, 26.2 miles and 4:41 on my gps. It was just after 1:30PM, the time I'd agreed to meet Swee where 6th Ave ran into the park. She called and I realized for the first time that I was off by an hour; I'd forgotten to set my watch back, and it was actually only 12:30. 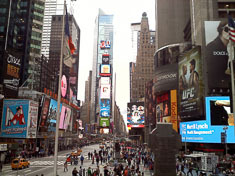 She was still at the hotel so after buying a hotdog with the last of my cash, I jogged back down 6th Ave to the hotel. After resting a while, we went out for an early dinner at the Heartland Brew Pub on 45th and 6th. Susan wanted to eat up by Central Park and agreed on dinner at a pub, but she was not happy with Heartland. It seemed too corporate, lacking in character, and nearly empty as well. She'd hoped for something with more atmosphere for our last dinner in the city. Fortunately the food was good, and I enjoyed the beer sampler as well. Their seasonal selection was a wheat ale flavored with lavender, odd but not bad. I found something to like about all six of the "classic" beers in the sample; each had a distinctive fragrance and a balance of malt and hops appropriate to the style. After dinner we talked for a few minutes with another couple, Mike and Jill Barr. Mike had run about 8 miles in Central Park this morning and now they were headed to a show starring Henry Winkler. They'd bought tickets for half price at TKTS. Inspired by their example we walked over to Times Square but couldn't find the TKTS stand. It was under our noses; Susan even took a photo of me on the steps of the red grandstand which is the roof of the TKTS building. I suggested we just go to one of the theatres and see if we could get tickets on the spot. Susan chose the Lion King and though the show had started 20 minutes earlier, they were happy to sell us a pair of tickets for $270. She loved the show and I enjoyed it too, mostly for the spectacular costumes and props. It seemed highly appropriate to catch a Broadway show on our last night in New York, even if it was a Disney production. I couldn't get Susan on my Alaska Air flight for under $600 one-way so I booked her on the Jet Blue flight an hour later for $338 instead. John & Mom drove us down to Portsmouth. We had a good visit with them. We didn't talk politics much, particularly since Obama won, just as John had feared. Bad for us financially, because our taxes will no doubt go up next year, but good for the country. I was grateful to see the Republicans lose despite Romney's last minute attempts to paint right-wing extremism as centrist moderation. Despite hundreds of millions of dollars in corporate and conservative billionaire money, they were unable to buy either the presidency or the Senate. The Republican strategy of blocking at every turn Obama's initiatives to stimulate the economy then blaming Obama for the poor economy and the high deficits incurred by Bush's tax cuts and foreign wars, failed. The bad guys lost, for a change. Susan's ankle has been swollen, bruised and sore since we left New York City. Apparently she injured it walking around the city in clogs last Sunday. Because it was painful to walk she asked me to order a wheelchair at the airport and I did. I had to get off the bus before her to check in for my flight, but I hustled over to her terminal and arrived in time to help her check in and handle her suitcase. The wheelchair showed up just at the right time and whisked her through security and to her gate while I returned to the Alaska terminal in time for a beer and a lobster roll at Phillip's seafood for about $20. Overpriced but tasty. In Seattle I waited at the airport for an hour or two for her delayed flight to arrive. I retrieved her suitcase while the attendants wheeled Susan out to the curb where David picked us up. We were impressed. Cold, dark and damp outside, but warm inside. Susan had the heat fixed while I was away, so we walked into a warm house. In bed by 4AM NH time. Rob Stretz, Kerry Wate and Arne Nelson put on this race, a free, minimally (but adequately) supported trail run with about 8000 feet of elevation gain and loss. Because of my lingering chest congestion, I determined to take it easy but ended up taking it a little too easy and didn't finish the 50K. 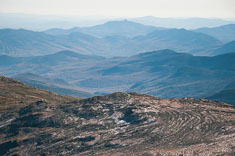 I ran with Monte and we swept the course from mile 12 (Hwy 900) to 25.5 (the TMT-High Point trail junction). We ran out of daylight so bailed out at High Point along with Tracy, Cary and Tracy's friend instead of continuing on to the Tradition Plateau and the finish. Except for the elevation change, the trails were easy to run. The course was almost entirely in the woods. 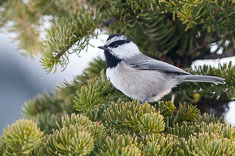 We had quite a few Chestnut-backed Chickadees and Golden-crowned Kinglets for company, along with a other runners and hikers of various ages. Thanks to our slow pace I felt pretty good most of the day, my only physical problem being hands so cold that at one point I couldn't even press the shutter on my new phone camera. The camera took reasonably good pictures despite the dark conditions, much better than my old phone would have done. I put a new chain on the chain saw today and it works much better now. Having the old chain sharpened was basically a waste of $8, especially considering that I was able to buy two new chains for $15 each. A few operation notes for future reference: when chain is properly tensioned, it should be snug enough on the bar that just 3-5 teeth clear the channel when you try to lift the chain out of its groove, and loose enough that it is not difficult to pull the chain along the bar by hand (pull only in direction of travel, which is away from the motor on the top side of the bar). To mix fuel, use 1Tbsp of oil in 1 pint of gas. The gas tank in the saw holds exactly a pint, so use the pint jar and red funnel to mix the gas and fill the saw as needed. Blade guard operation: pull back until it sort of clicks before trying to start the saw, and push it forward to disengage the chain from the motor. Starting cord pulls hard and jerky, and motor won't start, if blade guard has been pushed forward. Regarding the oiler, operation is automatic and oil flows even if not apparent when saw is first started. See youtube for operation and repair videos for the Stihl 021 saw. Anyhow, I finally made it out to the woodlot and cut firewood logs out of most of one of the fallen ash trees. Cutting a 6" log takes several minutes with the 30" bow saw I bought yesterday but only 15 seconds or so with the chain saw. I cut probably fifty dollars worth of firewood in about an hour and a half this afternoon, for less than fifty cents worth of gas and perhaps five dollars of wear on the chain. It will likely take me quite a bit longer than an hour and a half to haul it all up to the carport, split it and stack it, so if I include labor I'm not saving a whole lot over buying firewood, but it's all good exercise. David and I went shopping for Thanksgiving dinner, first at QFC and Safeway in Enumclaw, then at Marlene's and Costco in Federal Way, and finally at Metropolitan Market in Tacoma. The object of our quest was onions, the elusive 2-3" round yellow onions we use in braised onions. Metropolitan Market was the only place that had them, though we did pick up a dozen or so cipollinis at Marlenes in case we couldn't find the round yellow ones. Cipollinis don't work as well because they're flat and don't brown as evenly as the round ones. Between Costco and the Metropolitan, we did a little birding. 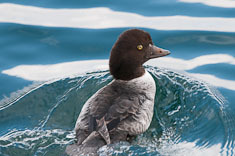 We looked for Ancient Murrelets at the Dash Point fishing pier and at Brown's Point but didn't find them. The tide was very high - completely covering the beach by the fishing pier. 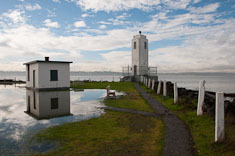 At Brown's Point the tide had receded a bit but had left the lawn flooded. Offshore logs and driftwood drifted by on the outgoing tide, plucked off the shorelines of Commencement Bay by the high water. We got rained out at Gog-le-hi-te looking for the Slaty-backed Gull but stuck around and were rewarded by a nice rainbow. After picking up a bag of 220 grit at Kleen Blast (my new Razr HD phone took us right to their door) we drove over to Ruston Way and found no birds of interest there either, though we did get some close-up shots of pigeons and a female Barrow's Goldeneye. At the Metropolitan Market we sampled cheese and bought some soup for lunch - David's curried squash soup was better than my red pepper bisque - before checking out with our onions. 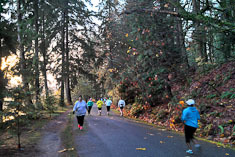 running and walking a couple miles w/ Marie Zornes and a couple friends of hers. I was pleasantly surprised by how easy it felt to run at 8:15 and even 7:40 didn't feel difficult, though I slowed down considerably for the last 8 miles and felt quite stiff and sore towards the finish. 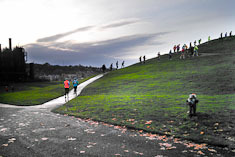 The weather was excellent for running, mid-40's with a thin overcast and no wind to speak of. Matt and Betsy put on the race and did a good job - no surprise there. 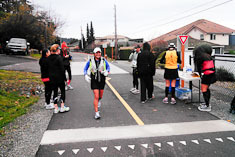 I particularly appreciated the hot soups at the finish and the Gu at the aid stations. It was fun to see people again too after being away from the local marathon scene for a couple of months. For Thanksgiving we took our dinner over to the McClarty's. They had Karin's nephew Eric and his wife Katrina over along with two friends of theirs from the Green Lake Church, making ten of us at the table. We brought walnut loaf, cashew gravy, braised onions, cranberry sauce and baked potatoes. Susan is still laid up with her sprained ankle so I did the cooking. Other than a minor mishap in which I added 3/4 cup of soy sauce to the loaf instead of 1/4 cup, everything went pretty well. I corrected the loaf by leaving out the salt and doubling the rest of the ingredients. Daniel called while I was cooking. He wanted the recipe for the braised onions because he's cooking an American Thanksgiving dinner for some Spanish friends of his. He finally got paid a few days ago. We'd been wondering if he would, given the financial troubles of the Spanish government. He's also making about €100/week teaching private English lessons. We talked some about the evolution of our concepts of Christianity. 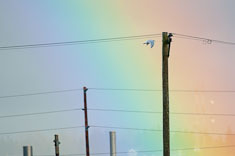 I told him that while I retained an experience that I would describe as an imaginary friend who might be Jesus who loves me and with whom I can communicate in quiet, I generally doubted that the paternal and all-powerful yet personal God that evangelicals find in the Bible actually exists, and that I saw no point in prayer other than as a meditation exercise. Daniel pointed out that my imaginary friend could also be the "Me" whom we met in Soltura 2, Me who feels, who knows, who accepts, who loves, who is not unlike God within us. In fact, in that course "Me" was mostly referred to as "God". Daniel and I discussed how calling that source of understanding "Me" emphasizes that it comes from within ourselves while calling it "God" puts it somewhere outside of us. I'm not sure where my imaginary friend resides. He/Me may be solely within me, or may transcend me in humanity, or may even be the divine Holy Spirit of whom the Bible speaks. Daniel has rejected the concept of an authoritarian God to the extent that he can now look at Christianity without feeling personally subject to any of its doctrines. He no longer responds to evangelical ideas with fear or anger. Being now immune to their personal impact, he described how now he can admire Christianity as a coherent and even beautiful system of belief, a work of religious art. "I'm not there yet" I told Daniel. "That may not be where you're going", he replied. I retain enough conviction about the evangelical Christian interpretation of the Bible that I still find it threatening even as I choose not to follow it. I choose not to subject myself to belief in a god who supposedly created me and loves me, yet condemns me to destruction for being whom he made me to be. Nonetheless it is difficult to disavow that belief system I adopted and counted as my own for more than half of my life. Difficult, but not impossible. I see it as a deception to look to an external, father-like god-figure for validation and approval. I won't find it there because God is but a mirror for my own attitude about myself. To the degree that I cannot realize love for myself within me, I won't accept it from outside either, whether from God or my wife or anyone else. But as I do increasingly find that love and self-acceptance within me, I also feel less and less need for an external god-figure. "Me" seems to be displacing "God". Scott and Denise put on a great little race in the Seattle Ghost. 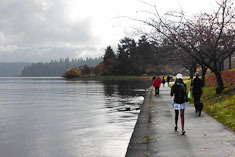 The course consists of a loop around Seward Park and an out-and-back north along the lake, both repeated twice. 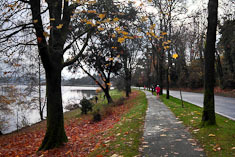 It's mostly on paved trails along the lake, flat and scenic. 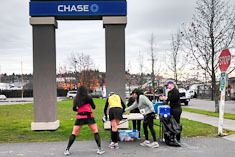 The event is popular with the northwest Maniac community in part because it is race #3 of the Seattle quadzilla - four marathons in four days over Thanksgiving weekend. Concerned that running marathons two days in a row would aggravate the chronic irritation in my left anterior shin tendon, I sat out race #2 and am not planning to do #4, the Seattle Marathon, either. As I expected, the tendon was tender and a bit sore yesterday but to my relief it held up just fine today. I took it easy, never running faster than about 8:45/mile and stopping frequently for walk breaks or to scope out ducks on the lake. I identified 41 species of birds during the race today, 5 more than at the Wattle Waddle thanks to duck diversity. group of runners, though actually at 151 races I'm in the top 3% of Maniacs, currently #133 out of 6200. 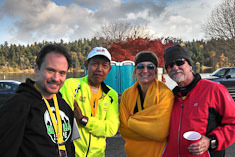 I ended up talking with Ray Shaw until Scott and Denise were all packed up, discussing prospective changes in the race qualification criteria and revisions to the Half Fanatics site. I kept urging him to try out the "Find a Race" function in the Half Fanatics, only to remember on the way home that I haven't written that page yet for the Half Fanatics, only for the Maniacs. 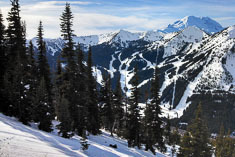 For our first snowshoe hike of the season, David and I drove up to Crystal Mt and hiked up the ridge you see on the left as you approach the ski area. At the parking lot the snow was only about 8" deep, crusty and wet, and the air temperature was around 40F. 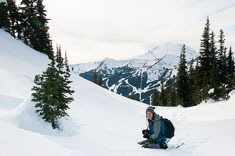 We started up snow-covered roads and continued onto the unsigned Bullion Basin trail to the first big switchback. There we left the trail and climbed directly up crusty snow, with a bit of wind-drifted sticky powder in places, up out of the trees onto an open slope where we wouldn't normally venture due to avalanche risk. 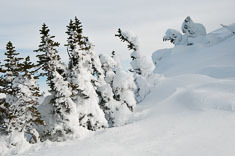 No risk today though; the snow was well consolidated and only a foot or two deep. 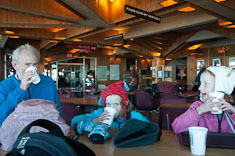 We didn't even need to put on snowshoes until after we stopped for lunch about 3/4 of the way up. Our lunch spot was warm and quiet, sheltered by one patch of trees and backed up against the sunny side of another, and was a welcome change from the cold wind sweeping across the open slope we'd come up. We didn't have much time after lunch so we hurried up to the ridge crest and explored south a few hundred yards to the first high point. 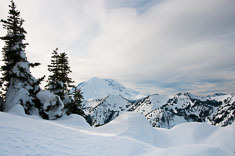 It felt like winter up there with snow and rime on the trees and cornices beginning to develop out of drifts along the ridge. 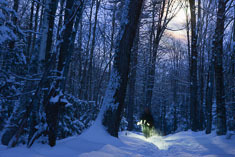 Due to an crusty glaze underlying the inch or two of new snow it wouldn't have been very good riding, but with snowshoes it wasn't bad. Descending we tried to follow lines of powder along the lee edge of tree stands; the snow was hard and slippery under the trees themselves and uncomfortably crusty out in the open. I was wearing summer hiking boots which didn't manage to restrain my toes from crumpling into the front of my boots, so as soon as I could, I took off the snowshoes. From that point down to the trail we had a quick descent, jogging at first, then sliding down the last several hundred feet on our butts, a brief but exhilarating ride. We listened to Freedom by Jonathan Franzen on the drive home and managed to get David back in time to meet Trevor and Catherine. 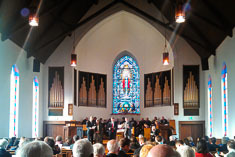 We visited the Green Lake church in Seattle for the first time in many years today in honor of Pastor McClarty's first Sabbath there. It's a more formal and classical service than at North Hill. John gave an excellent sermon about how Jesus's love is inclusive even when the church is sometimes inclined to be exclusive. He gave an example of two people whom Jesus would include, and whom the church might exclude except for the influence of the light of Jesus. One was a retarded woman who lacked the ability to intellectually assent to the doctrines of the church, the other a church member who found himself unwilling to accept the church doctrine regarding the age of the earth due to his studies in geology. I came away with a renewed sense of the broad reach of Jesus' love and how he empowered and encouraged the people who encountered him. After church we stayed in Seattle because we planned to attend a party for John and Karin back at the church in the evening. We tried the colorful Veggie Grill in University Village for lunch and found it quite good. I had the Urban Plate and liked the mushroom, the sauces and the tomato-guacamole salad though the tempeh wasn't very inspiring - tasteless and somewhat gritty. Probably the nature of the beast. Susan's Chikin' sandwich and David's Portabello sandwich were both good as well. Worth a second visit. 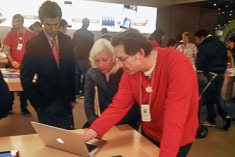 the MacBook Air and Laurance, our salesperson, did a winning job of explaining it to her, along with the iPhone and iPad. 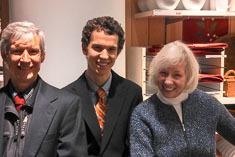 After a prolonged spell of standing at the Apple store, we wandered over to Crate and Barrel to sample sofas and got a passer-by to photograph the theee of us all dressed up for our Sabbath outing. For supper we dropped David off at the Sichuan Cuisine on Jackson Street to meet Trevor and Catherine and other friends and considered staying ourselves but drove downtown instead, with a stop first just down the street at LV Produce because I figured they might have persimmons. They did, lots of them at reasonable prices. I bought a bag of small Fuyu's for $3 (I think) and about two dozen big ripe Hachiyas for about $15, along with some Japanese eggplant and miniature Bok Choy. Fascinating place with all kinds of veggies I didn't recognize, and a lot closer than California for persimmons. in the back yard, then over at Gog-le-hi-te. As reported, the sensor has is littered with dust which shows up as a flock of fuzzy dark spots in the upper right-hand corner of images taken at about f8 or above. 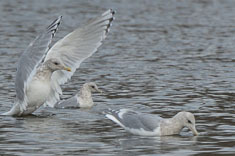 Since I don't have a normal-range zoom for it yet, I took mostly bird shots at f4 with the 200-400 and the 300f4. My plan was to use the D600 for landscapes and continue to use the cropped-sensor D300 with the long lens for birds, but after seeing how the long lenses performed with the D600 today, I suspect I'll end up using mostly the D600 for everything. 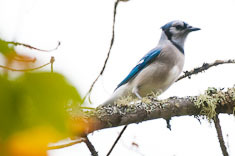 Bird photography is significantly easier, and the results significantly better, with the D600 than the D300. 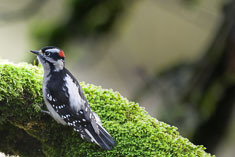 The wider field of view combined with higher pixel density means that even though the bird is smaller in the viewfinder (and therefore easier to find and track), the actual image cropped to the same pixel dimensions is sharper. Equally important, the D600 does a spectacular job at higher ISO values; ISO 3200 on the D600 is as usable, perhaps more so, than ISO 800 on the D300. Those two extra stops make a big difference, enabling me to shoot, for example, at 1/125 instead of 1/30 with the 200-400 or 1/250 to 1/1000 with the 300f4. A third benefit of the newer camera is that the autofocus is noticeably quicker, especially in low light. 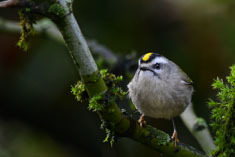 Taken together, the result is a much higher yield of acceptably sharp images and a greater likelihood that I'll capture a usable image of a particular bird. The only downside I've found so far is that the files are quite a bit bigger, averaging 30Mb for the raw files and 10Mb for the JPG fines. 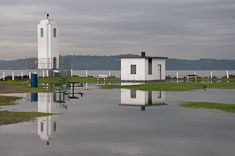 Seeking flying birds to photograph, David and I drove over to Emerald Downs but didn't find much activity in the fields west of the racetrack, so continued on to Gog-le-hi-te in Tacoma, a reliable spot for gulls. We weren't disappointed. 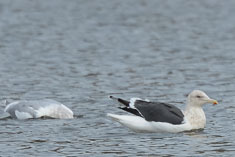 Among the hundreds of Glaucous-winged Gulls we found Herring, Thayer's, Mew and Western (or at least "Olympic") gulls, then while I was watching a mixed flock of gulls bathe in the east cove, a very dark-mantled gull flew in - the Slaty-backed Gull. It has been reported from Gog-le-hi-te multiple times over the past month but probably missed more often than seen. I watched it for 15 minutes through binoculars and scope, verifying all the field marks, and got photos of it on the water as well as in flight when it took off to the SW.
years but we still had a good crowd with three generations of some families showing up together. For future reference, we went through about three sixes of microbrews but only one of the twelve Bud Lights. After the party we attended the Christmas eve service at the Jackson Community Church, another tradition of long standing. The service formerly started at 11:00PM and ended with everyone filing out of the church at midnight with their candles still burning. Now for convenience and liability reasons, the service begins at 10:00PM and all candles are extinguished before the congregation is dismissed an hour later. Sarah and Mom both sang in the choir this evening. We read responsively and listened to a short sermon by the animated Reverend Pojen Lee. 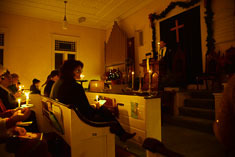 He spoke about three gifts of Christmas and we sang the old favorite Christmas hymns before lighting our candles from the Christ candle at the front of the church. Back at home, we continued with the clean-up from the party, which Susan completed some time after the rest of us went to bed. 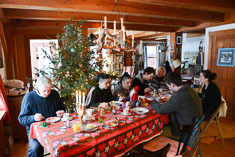 Traditionally we all drive down to Sarah and Roger's for a Swedish-flavored Christmas breakfast. Less traditional were the four inches of snow which fell on Christmas morning, silent flakes carpeting the crusty snow already on the ground and trimming firs and bare hardwoods alike with white while we ate breakfast. Mom got the almond in the rice pudding, conferring on her the privilege of opening the first present. Despite our collective intention to not do so many presents this year, the pile around the tree in the corner of the dining room was only barely smaller than previous years. We spent a delightful hour opening presents. Unfortunately I forgot to write down who gave me what this year, but I hope I thanked them at the time since most of them were in the room with me. After lunch of leftover party appetizers, none the worse for 15 hours in the fridge, the boys suggested a hike up Doublehead. 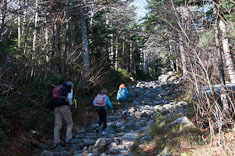 We followed a previously packed trail and encountered several hikers and runners descending as we started up. 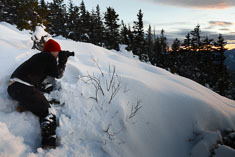 We reached the ledges on South Doublehead just as the sun was setting and took pictures until my fingers were too cold to press the shutter. The glow in the southwest faded through the trees until the light of the full moon took over. David lost a lens cap after a slip and a fall and though we all searched until after dark, we couldn't find it. By the flashlight on my phone we made our way out to the trailhead and the car. Everyone else was just leaving for Joe and Virginia's when we walked into the house. Turnaround took nearly an hour so we arrived for dinner just in time. I opened the Logsden Farmhouse Ales "Saison Bretta" that I'd given Daniel for Christmas and everyone shared a taste of that special beer. I thought it tasted better at the keg opening at the brewery last fall but with wild yeasts, every batch is a bit different. 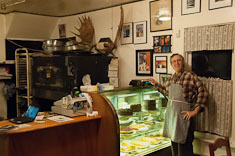 We ate roast beef and green beans with hot chilis and finished with three kinds of pie for dessert. After dinner and visiting, John made his way back down the icy steps to the car without mishap and we all went home to bed. It was a very good day.